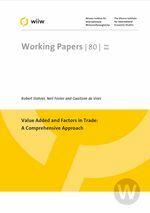 Based on recent approaches measuring the factor content of trade when intermediates are traded this paper provides an approach to decompose the value added and factor (capital, high, medium and low educated labour) content of trade into foreign and domestic components. This adds to the literature by simultaneously considering both exports and imports allowing a focus on the patterns and changes of net trade and its components and generalizes the commonly applied vertical specialization measures based on exports only. It is further pointed out that a country’s trade balance in terms of value added content equals its trade balance in gross trade. Empirically, results of the proposed decomposition based on the recently compiled World Input-Output Database (WIOD) covering 40 countries and 35 industries over the period 1995-2009 are presented. The domestic value added content of exports tends to decrease over time, increasing again in the crisis. Splitting up by production factors, emerging economies tend to export relatively more capital and import labour in value terms, with the opposite pattern found for advanced economies. Splitting up labour by educational attainment the expected pattern of the advanced countries being relatively stronger net exporters of high-educated labor as compared to low-educated labour in value terms emerges. This provides a distinct view on the structure of trade deficits and surpluses across countries based on its factor content. Finally, it is shown that the role of services is more important than would be suggested by conventional trade statistics due to the value added created in service sectors for production of manufacturing exports.